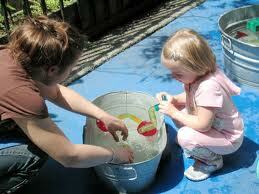 Keep it simple…fun and learning can happen as easily as a bucket with water and a few ice cubes! I was talking to my daughter the other evening after she had been babysitting some children of a wonderful Mom from one of my Mom’s groups I lead. She showed me pictures of the toddlers entertaining themselves with a tray of ice cubes. What a great way to spend the afternoon! I often want to tell Moms…”Don’t work so hard at it!” In other words, kids can be entertained and actually learn valuable concepts by simple activities. It often does not take a lot of money or expensive toys or classes to fill a morning or afternoon with fun and kids always learn with fun! It is summer and water is one of the best entertainers. A baby pool filled with a couple of inches of water, a water table, or a large under bed plastic storage container filled with a few inches of water will entertain for long periods of time. Dump ice cubes in the water and let the kids try to scoop them up or catch them. Let them watch the ice melt. Add measuring cups, spoons, pitchers, sieves and other kitchen items. Let the children fill things up, pour and dump. Add a little bubble bath and let them use an egg beater to make bubbles. Take a bucket of water and add paint brushes and paint rollers. Let them “paint” the sidewalk, patio, deck, or brick house. My son “painted” our house for hours. Get the tricycles, wagons, or even your car out. Let the kids play car wash! What floats and what does not? Let your child figure it out! Pretend play with cups, spoons, and bowls…what will they “cook” with the water? Throw a package of new sponges in the mix. Can they fill up a new bucket by squeezing the sponges full of water? Add dishes and a dish cloth. Let them pretend to “wash” the dishes! Give a baby doll a bath. Have small trucks and cars out to wash or make bridges to get over the water. Besides all of this fun…what has your child accomplished? So, relax, it is summer! Don’t work so hard Mom and Dad, keep it simple and fun. Take a child, add a little supervision, and who knew a little water and ice could entertain and teach so much! ← Parenting advice…a hindrance or a help? It can be both! I love all these simple ideas!